The Cutler-Hammer® Comet Series is a complete line of high performance, 18 mm tubular sensors with a variety of models and modes to solve virtually any sensing problem. The sensors are available in thrubeam,reflex, polarized reflex, diffuse reflective, focused diffuse reflective, wide angle diffuse reflective, Perfect Prox®, fine spot Perfect Prox and fiber optic sensing. Perfect Prox is one of the most powerful problem-solving sensors available. These sensors can reliably detect targets of different color, reflectance, contrast or surface shape at the same range, while ignoring background objects just a fraction of an inch away. The Comet Series includes AC/DC and DC-only models with, 3- and 4-wire circuitry. Choose from cable or microconnector. Each sensor features a light/dark operation switch and a gain control to provide for quick adjustment to peak optical performance. The unique threaded body with flat sides allows quick mounting in a 3.4" hole or against any flat surface. Internal components are rigidly sealed in a solid encapsulated package for excellent performance in high vibration and highshock applications. AC/DC Models: Sensor will turn off immediately when short or overload is detected (Indicator LED flashes). Turn power OFF and back ON to reset. IMPORTANT: During installation, correct power connections must be made first to ensure fail-safe short circuit protection of outputs. DC–Only Models: Sensor will turn off immediately when short or overload is detected (indicator LED flashes). Sensor will reset when short is removed. Note: These products conform to NEMA tests as indicated, however, some severe washdown applications can exceed these NEMA test specifications. Separate light source and detector units face one another across an area. The column of light traveling in a straight line between the two lenses is the effective sensing beam. An object crossing the path has to completely block the beam to be detected. Polarized Reflex The source and detector are positioned parallel to each other on the same side of the object to be detected. Another element, called a retroreflector, is placed across from the source and detector. The sensing beam is reflected from a retroreflector back to the sensor. The Comet Series includes polarized models with 3-wire and 4-wire circuits. Right-angle models are also available. Models feature a polarizing filter built into the sensor to ensure that only light reflected from a corner-cube retrore-flector is recognized by the sensor. This allows reliable detection of shiny targets that could reflect light and be missed by a nonpolarized sensor. Most models include a visible sensing beam for easy installation and alignment. Diffuse Reflective The source and detector are positioned on the same side of the target. The two components are aligned so that their fields of view cross. When the target moves into the area, light from the source is reflected off the target surface back to the detector. A retroreflector is not required. Forward and right-angle viewing configurations offer identical optical performance in this series. Perfect Prox® This is a unique type of diffuse reflective sensor that combines extremely high sensing power (called “excess gain”) with a sharp optical cutoff to ignore backgrounds. This allows the sensor to reliably detect targets regardless of variations in color, reflectance, contrast or surface shape, while ignoring objects that are just slightly outside the target range. This gives the Perfect Prox® an outstanding ability to solve sensing applications that would be difficult or impossible to manage with other types of sensors. It also makes Perfect Prox® one of the easiest photoelectric sensors to set up and use. Eaton’s Comet Series includes more background rejection models than any other family on the market. Choose from forward or right-angle viewing, 3- or 4-wire circuits, cable, micro or mini-connector terminations and a variety of sensing ranges. 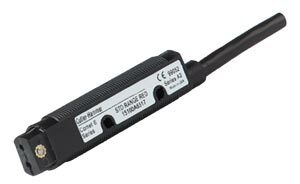 Fiber Optic The Comet Series also includes sensors that utilize fiber optic cables to sense objects where space is restricted, temperatures are high, or tight viewing angles are required. Choose from models that accept low cost plastic fiber optic cables, or use our patented glass fiber optic adapter that inexpensively converts our standard diffuse reflective sensors for use with durable glass fiber optic cables. Mounting Comet Series sensors feature a threaded housing and include two jam nuts and washers for mounting into any 19 mm (0.75") hole or a selection of accessory mounting brackets available from Eaton. The flat sides of the sensor feature two mounting holes for easily attaching the sensor to any flat surface with #4 hardware. Note: (1)For a complete system order one source and one detector; 11100 sources and 12100 detectors may be interchanged in any combination. 11102 models must be used with 12102 models. (2) Ranges based on 3 inch diameter retroreflector. (3) Right-angle viewing polarized reflex models are rated NEMA 1 only. (4) Polarized Reflex Sensors may not operate with retroreflective tape. Test selected tape prior to installation. (5) For complete system, order sensor and retroreflector. (6) Sensor will detect a 90% reflective white card at this range. (7) Sensor will detect a 90% reflective white card at this range.